After almost 4 years of intensive work, the Scribus Team (http://www.scribus.net) has released the new stable version 1.4.0 of the Open Source desktop publishing program Scribus. Given this is the first major stable release in some time, this document outlines improvements over the last number of versions, rather than since just the last one. The idea is to form a general comparison between this and the last stable release. In summary, more than 2000 feature requests and bugs have been resolved since the development of this new version started. 1.4.0 is based on the Qt4 application framework. The initial transition from Qt3 was performed quite quickly, but fine tuning for cross-platform compatibility and taking advantage of new features took quite some time. As a result, Scribus now runs equally reliable on all supported platforms. Thanks to the port to Qt4, the Scribus Team now also provides install files for Mac OS X 10.5 or later (DMG or pkg format), as well as a native version for OS/2 Warp 4 and eComStation. Additionally, thanks to feedback from users of other UNIX platforms, Scribus is will build and run on more of those platforms as well. Feature enhancements to object handling (e.g. transform tools like in advanced drawing programs), with improvements to existing features like the Scrapbook and the Image Manager. Many advanced options for text and typography, like character styles, optical margins, or glyph extension. Undo/Redo is finally available for almost all text-related actions, and a new script enables replacing straight quotes with typographical quotation marks based on language settings. Usability improvements include better cursor placement and movement, faster layout on canvas and interaction between linked frames. New features for vector objects, like Boolean path operations, vector effects or a line style editor. Major improvements to the handling of fills, like pattern fill, more gradient types, support for external color palette formats (AI, EPS, GPL, PostScript, SOC), and many new color palettes, including those from commercial vendors like Resene and dtp studio, as well as national/government standards. A new frame type called “Render Frame” allows for rendering (and subsequently export) the output of every program that can create PostScript, PDF or PNG files via the command line (e.g. LaTeX, Lilypond, POV-Ray) inside Scribus. The initial version of which was developed as a project for Google Summer of Code and this project has developed to allow import of externally produced documents, scientific publications and formulas. More renderers can be added with a simple configuration file. Vector import filters: Scribus 1.4.0 provides new import filters for the following file formats: Adobe Illustrator (both EPS and PDF-based), Macintosh Picture (PICT), Windows Metafile (WMF), Xfig (FIG), Calamus Vector Graphics (CVG), Kivio Stencils (SML), and DIA Shapes (SHAPE). Regarding bitmap images, the handling of Photoshop files has seen many major improvements, like support of multiple clipping paths or PSD layers. The Image Manager has been rewritten, and new non-destructive image effects have been added. Moreover, Scribus 1.4.0 now supports EXIF data in images, and import of Windows and OS/2 bitmaps (BMP) has been re-enabled. Among the major enhancements to Scribus’s pre-press features, printing marks and the display of ink coverage in the Print Preview are the most important. In addition, Scribus now enables conversion of spot colors to process colors during PDF and PostScript export with a single click. PDF export has seen major improvements as well. Scribus can now export to PDF 1.5, including PDF layers. Another new feature is the option to embed EPS and PDF files in exported PDFs as an alternative to rasterizing them. Also, both font embedding and substitution have been improved. For color management, Scribus 1.4.0 now supports both littleCMS version 1 and 2. It’s also possible to enable color management with a single click from the main window. Additionally, the Scribus Team has added a feature to emulate color blindness on screen. Hundreds of minor and major usability improvements have been added. The included scripts have been updated, including the addition of the “Autoquote” script in the Script menu to convert straight quotes in a text frame to correct quotation marks for many languages. Scribus 1.4.0 is being shipped with many more templates than previous versions. The content of the Help System has been rewritten and updated. Now that Scribus 1.4.0 has been released, the Scribus Team will focus on stabilizing the 1.5 development branch, which will comprise amazing new features like support for PDF/X-1a, PDF/X-4 and PDF/E, Mesh Gradients, native PDF import, XAR import, a completely rewritten table implementation, a rewritten text system, and much more. The 1.4.x version is now in stable/maintenance mode, which means few features will be backported from the 1.5 development branch. In general, only bugs will be fixed in subsequent 1.4.x versions, along with new content, like new translations, new templates, or additional color palettes. If you are working with a team, try to make sure that all team members use the same Scribus version – this will avoid many headaches and extra work. Users should be warned that 1.3.3.x cannot open 1.4.0 files. The Scribus Team recommends that all distributions package Scribus 1.4.0 as “Scribus” (and replace the outdated Scribus 1.3.3.14). The Scribus Team will continue to implement new features and improvements in the development branch 1.5.x. We recommend the additional packaging of 1.5 only if it is marked as a development version and can be installed alongside an existing Scribus 1.4.0 (for example as scribus-ng). The English online help has been mostly updated to match the new features. Translations have temporarily disabled, since they need to be synchronised with the English version once the update is complete. Further updates will be included with subsequent 1.4 releases. The Scribus Team would like to thank Anduin.net and Modirum for their continued hosting of all of the Scribus websites. We are also grateful to the Organisation Internationale de la Francophonie and Linux New Media (Germany) for sponsoring. As of July 2011, the Scribus Team is also pleased to welcome Resene Colours (New Zealand) and Marabu-Druckfarben (Germany) as Special Supporters and donors of colour palettes which are part of the 1.4.0 release. Finally, the Scribus Team would like to thank the many end users, translators, testers and contributors who helped us with this important release. Scribus is an Open Source program for professional page layout with press-ready output to PDF files. Underneath a modern and user-friendly interface, Scribus supports professional publishing features, such as color separations, CMYK and Spot Color support, ICC color management, and versatile PDF creation. However, after posting a short e-mail, during the time of dial-up internet, I got an almost instant reply with a: the correct fix b: a question I cannot remember exactly, but well, it struck me as the right kind of question.So a good sign. Not long after that, began a long series of e-mails about page layout, PDF and design over the course of probably 2+ years. It was clear way back then Franz had the singular idea to create a page layout application with a robust powerful PDF engine. Then and now, it was a brilliant design decision in my opinion. The release of 1.0 which got the front page of slashdot and took out the community ISP in his town for 3 days and oops, my most important clients’ web server traffic climbed 5000% in a few hours, as all the screens shots were directly linked. One other strikes me is testing a pre 1.0 version of Scribus in my client’s service bureau and seeing the color managed preview nearly perfectly matching the PDF output in a RIP. Another one is seeing LGM #1 come about from some idle chat in IRC. We expected an attendance of 50 to arrive and got 200.. In the intervening years, Franz, Craig, I and others, along with our families have shared holidays together; quite a special thing to see when it all began over the Internet – across continents no less. Even better, we are still involved daily, because we have a lot of mutual respect and the bonds of friendship, but its still fun! We all know the saying “sometimes life gets in our way,” meaning that something didn’t work as expected. Scribus is no different, although in our case one major fact of “life getting in our way” was newly born (or soon-to-be-born Update: useradd -groups vanek,boys -c "23.07.09 7:00am; 3.2kg, 0.5m" filip) babies, meaning an all-out positive distraction. There were other reasons, of course, that led to the delay of 1.3.5’s release, but after a long time of frustration with the progress of the code, we now have a lot of reasons to expect a bright future for our project again. Especially thanks to the infatigable efforts of Jean Ghali (jghali), Craig Bradney (MrB) and Pierre Marchand (pierremarc), 1.3.5 is 99% finished now. The number of bugs they have quashed over the last 12 months is simply astonishing! Google enabled us to add some really unique features via its Summer of Code programme, among them support for an almost infinite amount of markup languages like LaTeX, Lilypond or POV-Ray, or import of CorelDraw files, as well as a huge list of other vector or bitmap file formats. This year, the Scribus Team was confronted with 6 GSoC applications of equal quality, but given the large amount of applications, the Google selection process required us to select four students, which turned out to be very hard. Fortunately, we have good and reliable friends in India, namely Sarai. Since most of this year’s applicants were Indian citizens, Sarai, in cooperation with NIXI, enabled two other students from India to work on a Scribus-related project by means of a fellowship. The author of this rant has contacted colour vendors all over the world and asked for digital colour palettes of their proprietary colours under a Free license. The reactions, so far, have been mostly positive, but in most cases, the licensing conditions still need to be negotiated. The major exception here is the New-Zealand-based colour vendor Resene. The company didn’t hesitate one second to support Scribus, and their willingness to cooperate and their speed, as well as their professionalism, left me speechless at times. All that being said, and with a big Cheers to our supporters, I’m more confident than ever when it comes to the future of our project. Voita Scribus-kirja itsellesi tai yhteisöllesi edelleenjaettavaksi. Suomenkielisessä blogissani, Hiiop, on käynnissä kilpailu, jonka palkintona on uuden karheita Scribus-kirjoja. Kilpailu kirjoista päättyy 14.6. ja on avoinna kaikille, joille kirjan voi lähettää Suomessa sijaitsevaan osoitteeseen. Send email to the developer(s) of your favorite Free Software applications on March 27th and tell them how you use the software and how much you appreciate the hard work they do. The Official Scribus Manual for Scribus 1.3 series pre-order site opened today. The deal is as good as it can be – 10% discount if you pay immediately by Google Checkout and the worldwide delivery is free. See http://flesbooks.com/ for more information and to pre-order your own copy of the 438-page manual that covers every cool feature Scribus 1.3.3.x has to offer. Book’s estimated release date is December 19th, 2008. This is that time of year again. The wonderful folks at Google have announced (http://code.google.com/soc/2008/) that they were running their Summer of Code program again. We at the Scribus Team are quite excited about it in part as one of the two newest additions to our group Hermann Kraus has made his way in through the excellent work he did for us during GSoC 2007 and in part because we had such a great time of it last year. This is a terrific program that brings innumerable benefits to the Open Source ecosystem. We are hoping to be a part of this process this year as well, so we are working on our application and are soliciting ideas for potential GSoC 2008 Scribus Team projects from the larger Scribus Community in our wiki at http://wiki.scribus.net/index.php/GsoC_2008_Ideas. Let the summer of fun and learning begin! Storing documents in text, in XML, in Scribus to be exact, is a really cool thing. Let me show you a real life example. A million downloads for a project like Scribus. What is the significance ? What does that tell us ? The technical part: Just shy of 20TB of data. Or looking at the rough averages currently, one person downloading a copy of Scribus every two minutes or so. Two years ago when we started hosting our downloads on Sourceforge we averaged 4.5Gb of data. Now we’re getting close to 2TB some months and the trend is steadily upward. Moreover, those numbers are actually lower than reality when you consider it only counts downloads of Scribus after 1.2.something and we host a lot of binaries on the OpenSuse Build Server and we also have a separate Debian/Ubuntu repository. Lastly, almost every Linux distro includes Scribus by default. So, where does that leave us ? What does it tell us ? The plain numbers are kind of dull and boring, but what it represents in the bigger scheme of things is that a complete and very healthy ecosystem has evolved in the area of Free and Open Source graphics applications. You can do serious professional grade publishing reliably using only open source tools. When Scribus was started there was GIMP and a then sometimes rough on the edges Ghostscript, but not much else. No Inkscape, no Krita, no Fontforge, a dearth of decent professional grade fonts and very few which were really capable beyond Latin and CJK languages. Font managment plain sucked. Keith P. will go to heaven if only for making fontconfig and thus font installation sane on *nix. Early Scribus had all kinds of hacks and code just to find fonts, not any kind of sanity checking or other goodness we can now do with Freetype2. Which leads us to today, where we can see GIMP getting GEGL and its long promised deep color spaces. Krita2 in a short few months will have a lot of goodness Scribus users will really groove on (and it might be really running stable on Windows.) Inkscape is making its first baby steps in adding color managment and they are really trying to make it work perfectly for Scribus downstream. Lprof, the color profile maker now is cross platform and is getting hardware support for pro grade colorometers. Even better is the community of people who have emerged around Scribus and other FLOSS graphics apps. We have things like Fontmatrix which I ranted about earlier popping up out of nowhere to complete the scenery. LGM 1 and 2 were great and I fully expect LGM3 to meet or exceed them. What that million means is are now enjoying what was just something we could only dream of when Scribus 0.2 (~ 150 downloads) was so modestly launched in 2001. You know how it is, idly chatting in #scribus, compiling a little, surfing here and there… and suddenly you want to know the distance from Montreal (site of LGM2 ) to Victoria (site of FOSS4G 2007 ). Nothing as easy as that, just ask Google Maps for directions and it’ll give you the km number for free. Unfortunately there are quite a lot of Victorias around the world, so you have to choose the correct one (in British Columbia). But seeing other locations listed, from Texas to Australia, you obviously try some more, just for the fun of it (maps.google.com sadly only offers destinations on the North-American continent). Ok, no route to Victoria, Australia, nor to Victora, Seychellen — not really surprising. The distance to Victoria, Texas is even shorter than to Victoria, BC, that’s a (small) surprise. 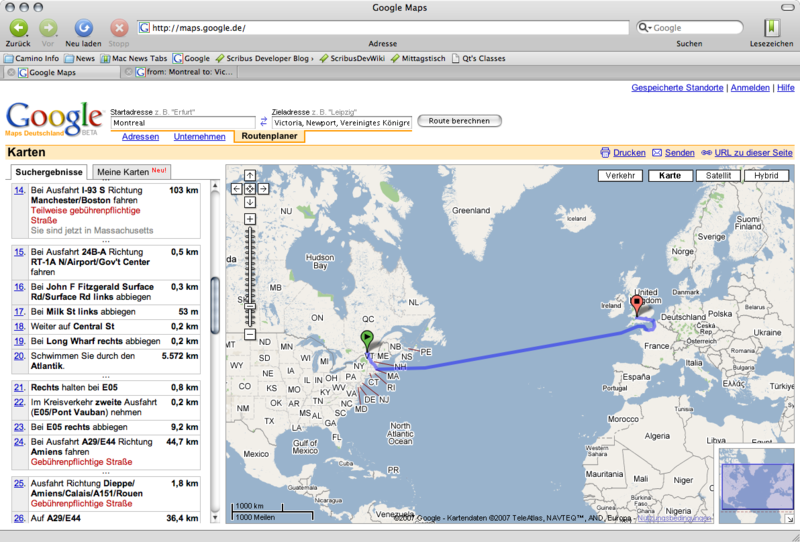 But now: Google Maps Deutschland does have a route to Victoria, UK. Yippee!